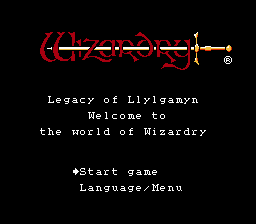 Wizardry II: Llylgamyn no Isan is a role playing game for the Nintendo Entertainment System. 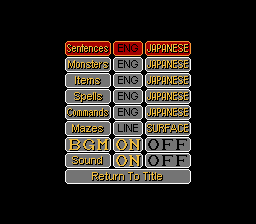 Here is a translation patch which translates the options menu where you can change the language from Japanese to English. Previously the menu was all in Japanese but now it is in English so players can navigate through much easier to make the needed adjustments. Version 1.1: Changed the default language to English. 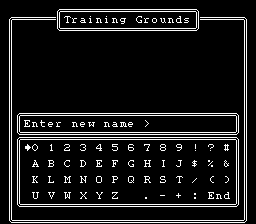 Translated the default character names, and set the default alphabet to use when creating or renaming new characters. If English sentences are specified, the default alphabet is English uppercase, while a Japanese alphabet is used if Japanese sentences are selected. You can still select different alphabets during character naming by pressing the select button. With these changes, everything defaults to English, so English players don’t need to change anything in the language/options menu at all. 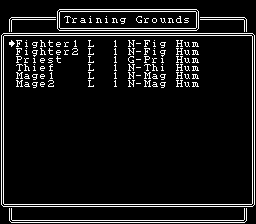 Note that the default character names and language selection is only applied if there is no existing save for the game. If you have an existing save, the options you had selected and your existing characters will not change. It will however use the appropriate alphabet when naming and re-naming your characters. darkmoon2321 Hacking Modified it to goto English lettering by default on name creation when English is chosen.